I have a friend who works in the food industry. He gets lots of free samples of many delicious things and he always knows when their is something food-related going on. I tell him that that is the only reason we’re friends. This week was the Japan Hobby Show, which involves an amazing array of crafts. I wish I’d had time to look around because there was everything from knitting, jewellery-making, art… and many kinds of creativity that I simply don’t know the name of! However, I’m not creative in that way. I’m only creative when it comes to finding different ways of filling my stomach with delicious things and sharing that deliciousness with all of you. So I hung out in the food corner – the Hobby Cooking Show. There were many kinds of demonstrations and workshops going on, including what looked like a really informative (read: yummy) bread talk with a whole plate of tasters. But unfortunately, I arrived too late to take the time to participate. I was keen to know about all the products! I was impressed with how willing people were to talk about and show off their products, even when it became clear that I might be able to ask questions… but was completely unable to understand the answers. 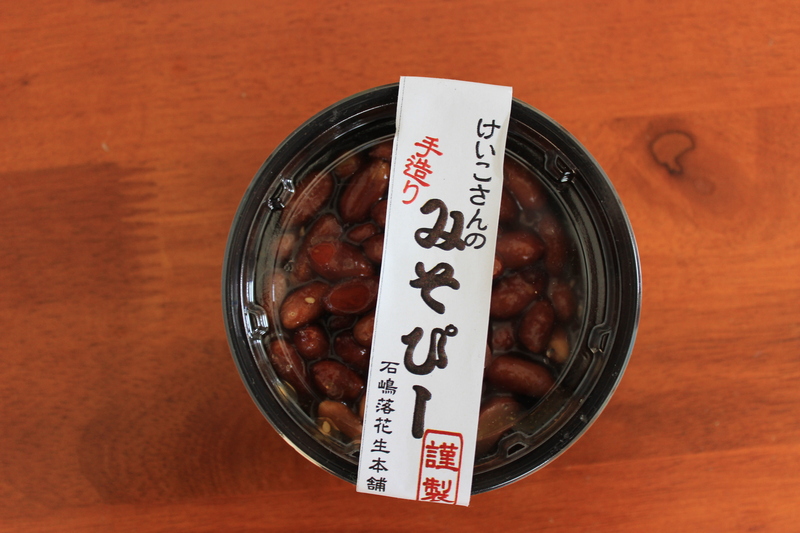 Peanuts in sweet miso – OMG! 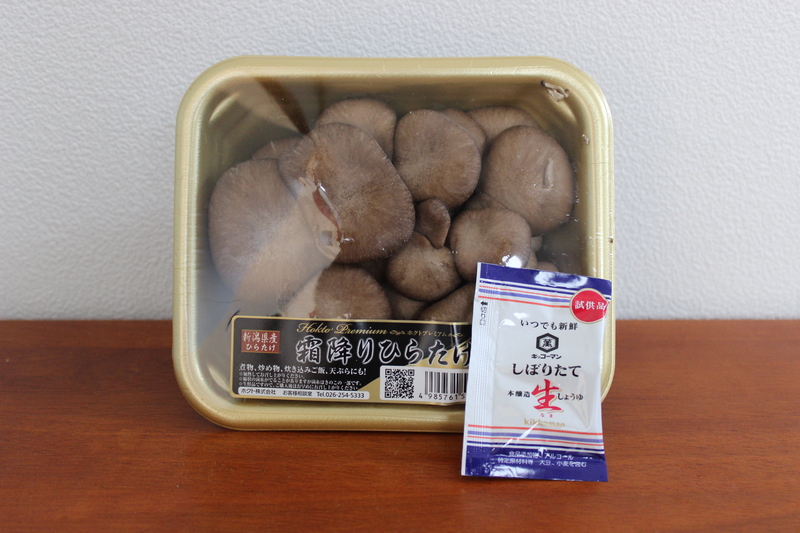 Who knew mushrooms could bring this much tastebud happiness?! Words cannot describe how good these taste. 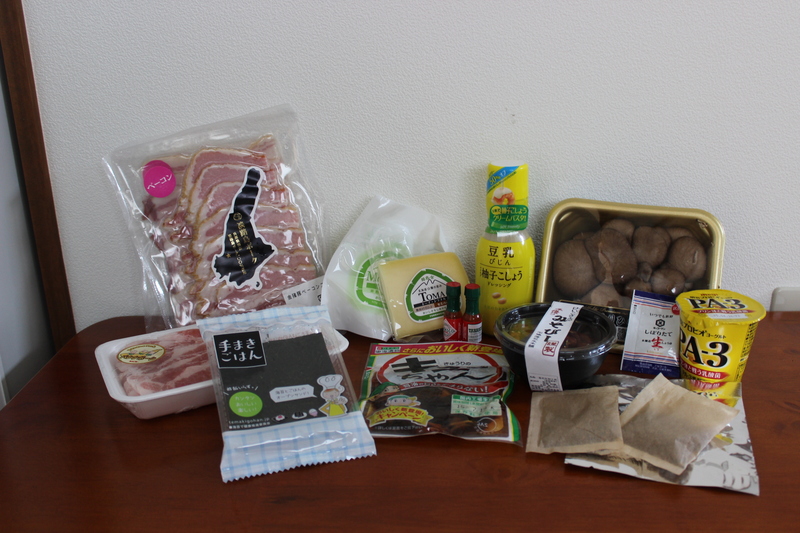 And they were selling packs for 150円. 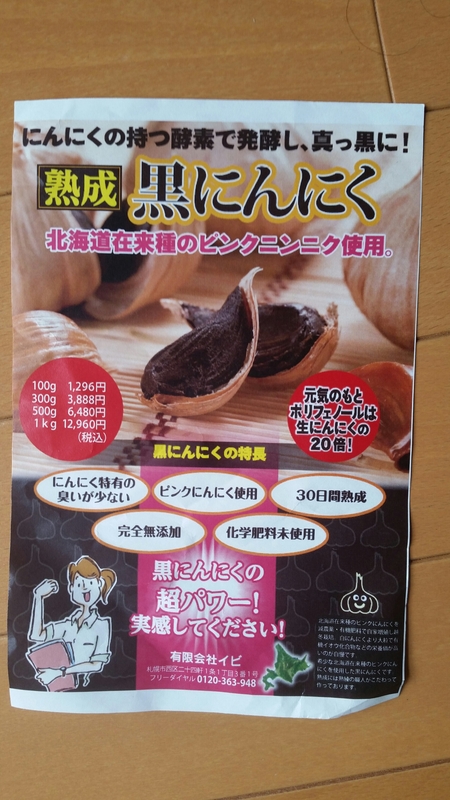 Which come with a little pack of Kikkoman soy sauce for flavouring. Temakigohan has one of the funnest displays at the show. 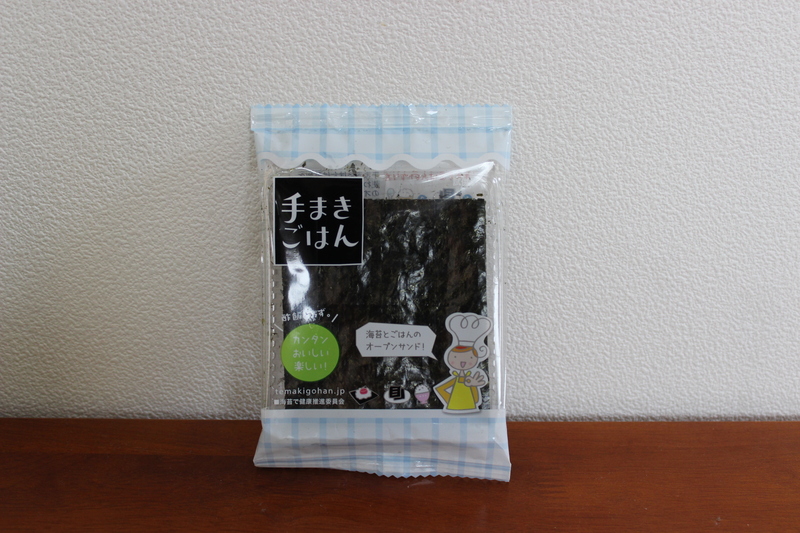 First of all, I got to sample nori from three different prefectures, including Saga and Chiba. 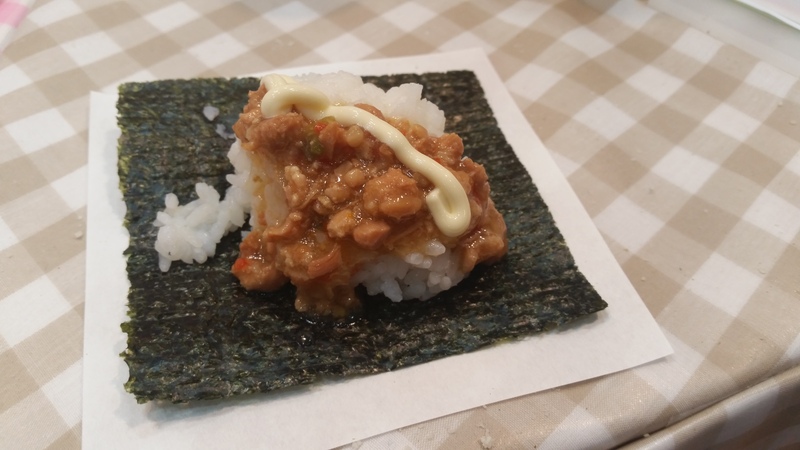 I was then given a larger sheet and allowed to choose a filling (spicy chicken) and a topping (mayonnaise) to make my own open riceball creation. Plus it was delicious. 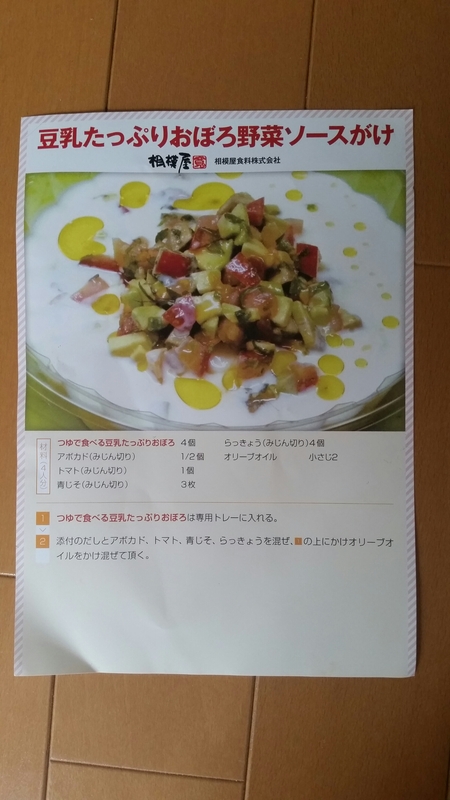 After this, I received a freebie pack of Saga nori, which I genuinely think has a lovely light and warm flavour. 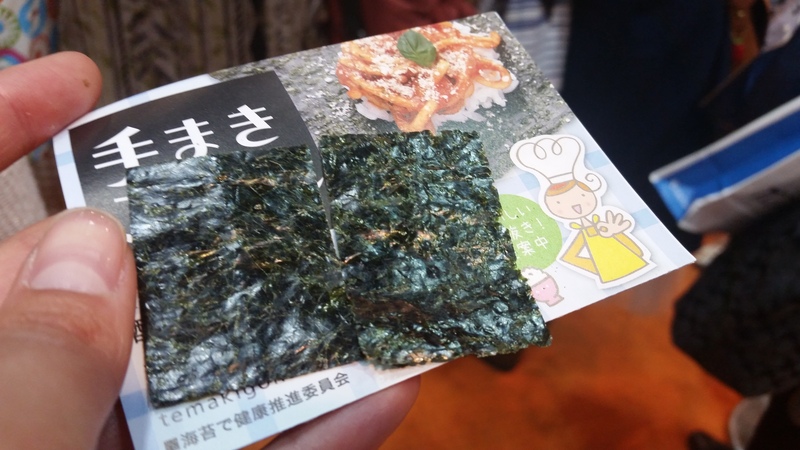 I’m new to eating nori so these are high words of praise! In fact, I’m looking forward to making a few rice creations soon. Yes, pickles are worth getting excited about. These cucumber pickles are flavoured with ginger, sesame and soy, among other things, and they rock. 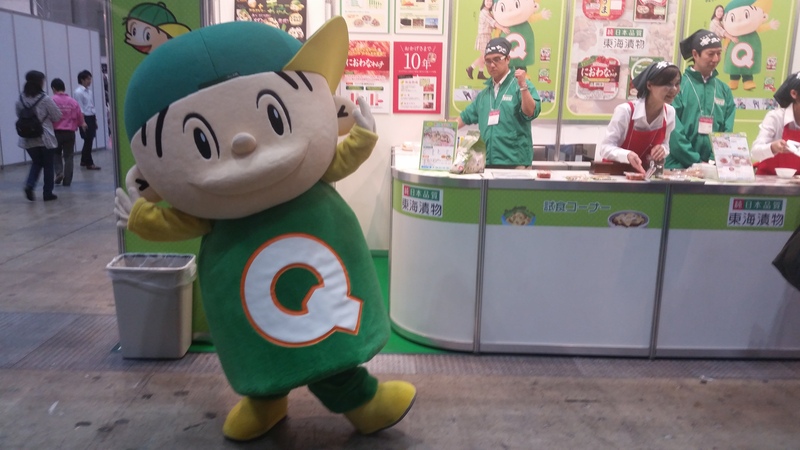 Almost as much as little green baseball cap-wearing Q-Chan, which inhabits and entire little website village to sell you his awesome pickles. He also made an appearance at the show, dancing around and posing, like all good boisterous kids. Having tasted this amazing punchy sauce, I found it had just sold out! I bemoaned my bad luck to the staff when a woman gave me hers! She had yet to pay for it, and she was going back to the fair the next day – or so she told me despite my protests. That’s kindness. 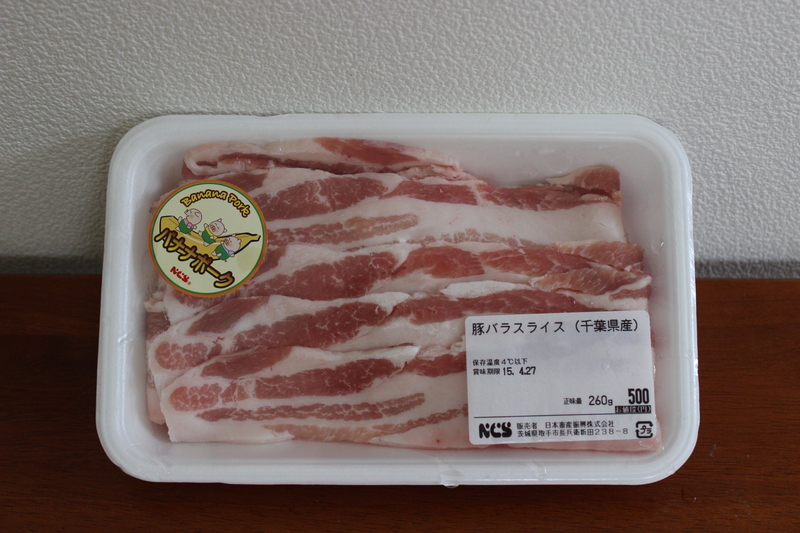 According to this website (in Japanese), banana pork is from pigs reared on a bananas mixed into their normal feed. The meat tasted nothing like bananas but was soooo tasty and a reasonable price that I bought a pack. 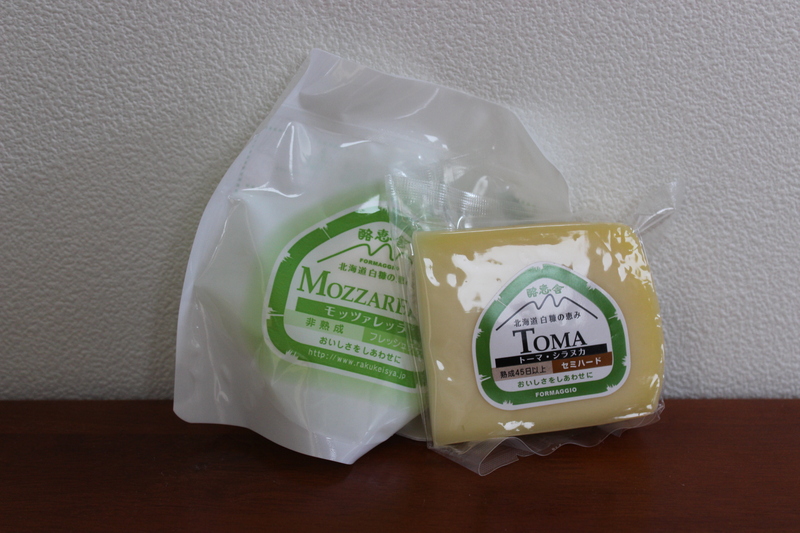 I’ve yet to try these cheeses (bought together for 1000円 – yes, cheese is painful expensive in Japan) so expect an update soon! Me: Hello! 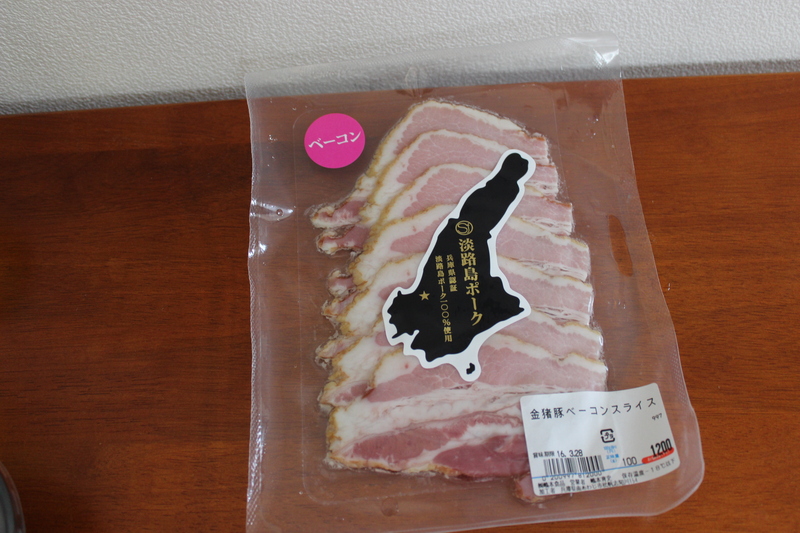 Are you selling your bacon half-price – 600円 a pack? Yes? Well I’m English! I have to have bacon! Give me TWO packs! Tofu is divisive. People say “Oh, it tastes of nothing. What’s the point? !” And until I went to Asia that’s what I thought. But I’ve come to appreciate that it has a mild taste of its own and works brilliant as a base for supporting other flavours. I love seseme dressing, for example, but I’ve discovered that drinking it from the bottle isn’t a brilliant idea (yes, I was stupid enough to try it). It NEEDS tofu. Sagamiya have a great selection of creamy tofu pots with different flavours. 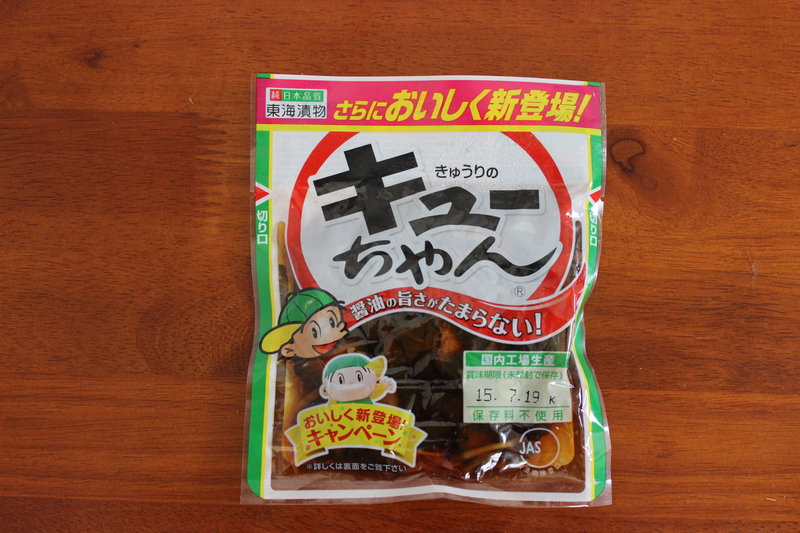 I tried a soy-sauce cold one at the fair and was tempted to buy a selection for tofu meals on the go. You can see their full range here. Contact them at the following address/number if you want some! I’m a little bit ashamed but this processed dairy whipped margarine-like product was actually pretty tasty. 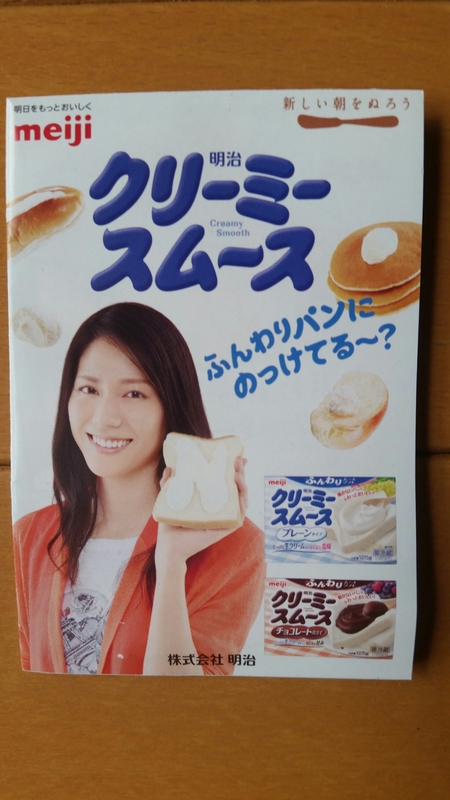 It’s made to go on pancakes and bread – basically any kind of doughy, sweet creation. I was going to look up what it actually is, but then I realised I don’t want to know. You can explore for yourself here. 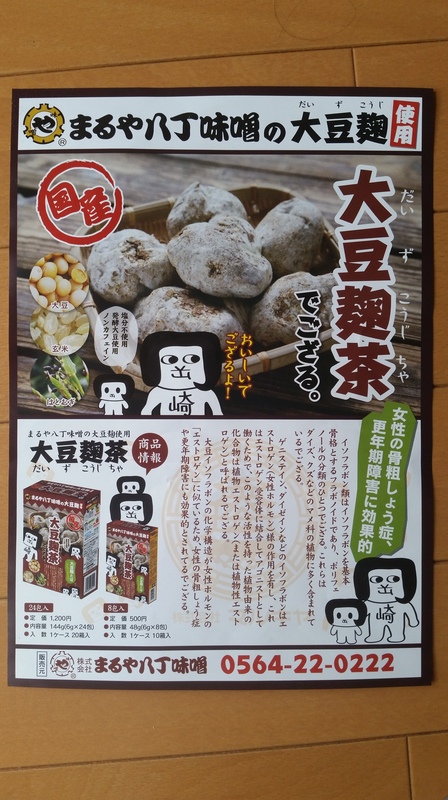 Originating from Hatcho, a village in Aichi prefecture, this company makes delicious miso by fermenting the ingredients in wooden barrels for two summers and two winters. 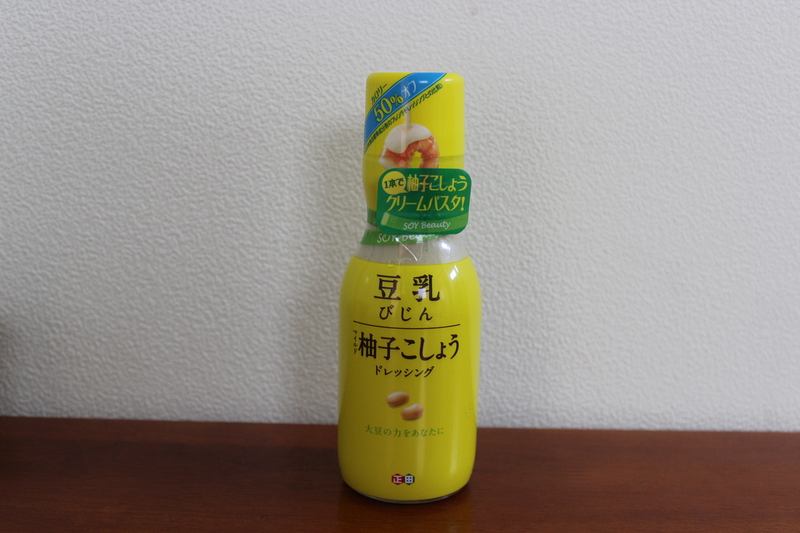 Not only does their miso taste amazing, but they were also promoting some rather good tea – Daizukoujicha / 大豆麹茶 – made from soy beans, rice, and pearl barley. I’m not a tea-drinker but I cannot wait to boil up a litre of this, stick it in my fridge and spend a hot day glugging through it. It’s so refreshing. Visit their website or give them a call on 0564-22-0222 to order! I love how Japanese People have a Mascotte for everything! I know! Have you seen the Give Blood mascot? He has BLOOD DROPLET EARS!! Hahaha so cuteee *. * (and creepy).